1. Finely chop onions, grate carrots, peel and dice tomatoes, cut fish into 2.5cm pieces and parsnip into 1.5cm pieces. 2. In 5l pot with oil, slow cook the chopped onion. 3. Add carrots and parsnip to the pot and mix to heat through for a few minutes. 4. Add fish and gently mix for a few seconds. 5. Add the stock, water, salt and pepper as desired, and slow cook on very low heat for 8 minutes. If the stew still boils on the lowest heat, remove the pot from the heat for a minute. 6. 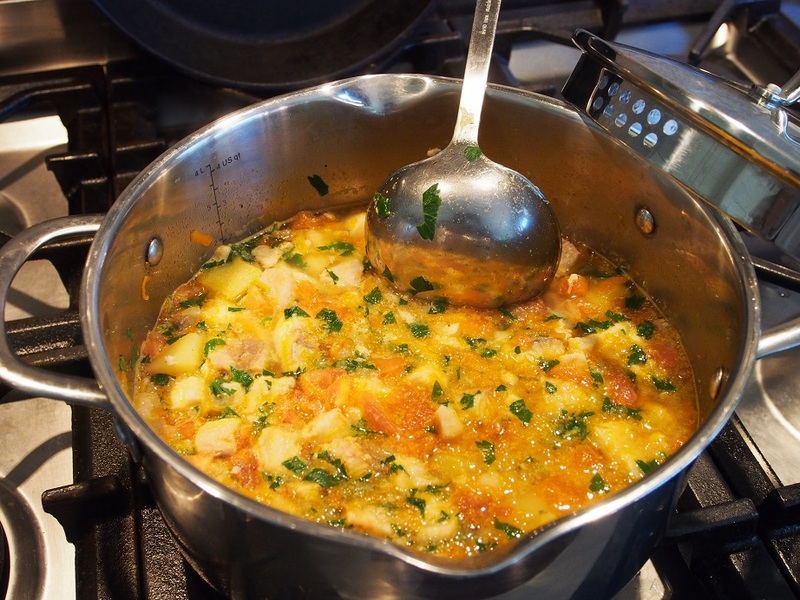 Add finely chopped parsley, diced tomatoes, garlic and lemon juice, gently mix and switch off the stove. 7. Offer cracked pepper when served.